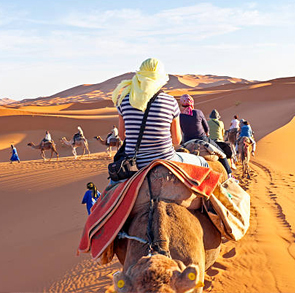 The Marrakech to Fes Desert Trip is Morocco’s most popular desert tour, connecting these two imperial cities passing through beautiful ancient villages, the Sahara desert, and amazing expansive landscapes. The distance between Marrakech and Fes is about 530 kilometers and you’ll have to spend at least two nights and 3 days on the road. With exceptional local food, unbelievable scenery, and ancient villages dating thousands of years and still being used today. The Marrakech to Fes desert tour is an experience not be missed. Starting from 8am, the desert tour from Marrakech to the Dades Gorge takes about 7 hours, where you’ll pass through the Atlas Mountains, as well as traditional Berber villages. You will also visit the UNESCO Heritage Site of Ait Ben Haddou, which is a village that originated 12,000 years ago, and was an important part of the Salt Road. Today, it is famous for being a popular location for Hollywood movies and TV series. The famous movies filmed here include Indiana Jones, Lawrence of Arabia, Gladiator, and the TV series Game of Thrones, season 3. Here, you will have lunch in the picturesque village, where structures are still being used and makes for the perfect opportunity to indulge in local food amidst an authentic ancient village. The next stop in your Marrakech to Fes tour will be a visit to Ouarzazate, before heading to the Dades gorge through Skoura and the rose valley. Once you reach the Dades gorge, you will end the day and retire at a traditional kasbah. On the second day of your trip from Marrackech to Fes, we will drive to the Erg chebbi dunes in Merzouga (the Sahara desert). Along the way, you will pass through Berber villages such as Todra Gorges, Tenhir, Erfound, and Rissani, considered to be one of the holiest cities in Morocco, and where the actual dynasty that rules Morrocco originated. It’s founder is buried in the village. 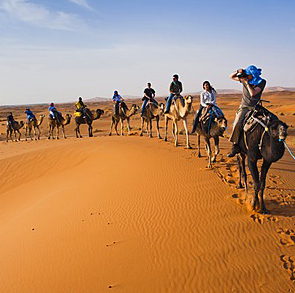 From Rissani, you will cross a rocky terrain to Merzouga desert, where a camel caravan will be waiting for you. 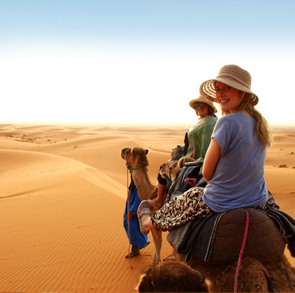 You will enjoy a camel trek over the Erg chebbi dunes to catch the beautiful Saharan sunset. You will then retire at a Sahara desert camp, where dinner will be served under the stars and local nomads will be playing traditional music with traditional drums throughout the night. On the last day of your Marrakech to Fes tour. An early sunrise experience is recommended from the Erg chebbi sand dunes, followed by a camel trek all the way to the Hotel where breakfast will be served by local Berber people.The long, 8-hour drive to Fes on board a Minibus will pass through scattered villages. You will also cross through the Middle Atlas Mountains, with an option to stop at the cedar forests to look at monkeys. Lunch will be enjoyed at local restaurants along the way. You will be dropped off at you accommodation in Fes . 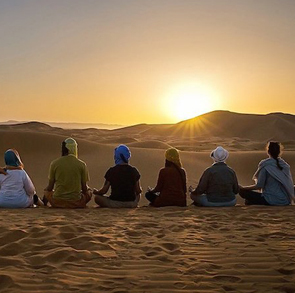 There you have it, a long, yet, fulfilling desert tour from the imperial city of Marrakech to the city of Fes, where incredible landscapes, a Sahara desert experience, and an immersion in Moroccan history is yours to enjoy for 2 nights and 3 days.